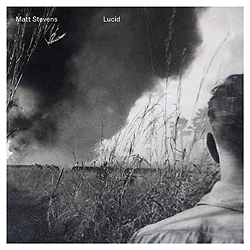 It has to be said you will either love or simply discard the new album from Matt Stevens when it comes to your own musical taste. Don’t get me wrong, you will love it if you expand your musical horizons and allow him in, trust me. And so, with that all said, Lucid sees Stevens joined by a host of guest musicians including Pat Mastelotto (King Crimson), Lorenzo Feliciati (Naked Truth), Charlie Cawood (Knifeworld), Jem Godfrey (Frost) and even vibes player Jon Hart. On a record that reflects his obvious, devoted love of Jesu and Celtic Frost as much as the Mahavishnu Orchestra and King Crimson within him, Stevens bringing Mastelotto in (on drums) from King Crimson was a stroke of genius. Add to that he has brought back Chrissie Caulfield (Helicopter Quartet / Crippled Black Phoenix) who played violin on the previous records and you can now see just why this new album has some deep guts to it. In short, if you’re looking for delicate guitar work to grounded experimental moments to massive post-rock epics, this album really has it all. It pushes boundaries, experiments freely, and as much as that might scare a few people off, it should also bring Stevens a whole new appreciation within the business.